I had lunch with my God Mother last week which was a special treat. I haven’t seen her for years, but we started exactly where we left off, chatting and gabbing hours away about everything and anything. But her presence wasn’t the only treat of the day. She brought along a gift of Tate’s Gluten-Free Chocolate Chip Cookies for me. For those of you that haven’t tried these cookies yet, you must. These thin, crunchy cookies taste like homemade. Eating just one is almost impossible. They are just that good! And best yet Tate’s has more varieties of gluten-free baked goods that I can’t wait to try including, double chocolate cookies, ginger zinger cookies, and gluten free brownies. All of Tate’s Bake Shop gluten free items are produced in a dedicated gluten free facility and are certified by the Celiac Sprue Association. Thanks to my wonderful God Mother, Kay, I was bale to discover Tate’s Bake Shop’s gluten-free cookies! All of these wonderful reasons are why this week’s Friday Favorite is awarded to Tate’s Gluten-Free Chocolate Chip Cookies! Congratulations! I’ve recently revisited one of my favorite veggies from when I was younger, and I can’t get enough of them! BEETS! Yes, BEETS! But the only problem is I hate the “tin can” taste of beets from a can. That is why I was so super excited to find Love Beets – Cooked beets that are ready for anything. When I was younger my Mom would serve them up heated, as a side dish. But recently I’ve discovered that beets are ready for anything and can be enjoyed in many more ways than I could imagine. Beets are great chopped on salads (my favorite salad to add them to is a Cobb Salad), or sliced and sprinkled with a touch of champagne vinegar and kosher salt. I also love the recipes that are featured on the Love Beets website, like this Grilled Cheese with Beets & Basil Aoili or Quinoa Beet Burrito Bowls with Cumin-Lime Tahini Dressing. Love Beets are all natural, gluten-free (note that all of the the Love Beets are gluten-free with the exception of one variety of the Baby Beets… the Honey & Ginger), contain no preservatives, and are Non-GMO. The Cooked Beets come in a 8.8 ounce packages packed with larger beets that are great for slicing or a 6.5 ounce size of baby beets which are perfect for snacking. I however, buy my Love Beets at BJ’s Wholesale Clubs that have a club-sized packages that are perfect for satisfying my new-found and obsessive love for beets. =) If you want to find where you can find Love Beets near you, check out this link. All of these reasons are why I am so very grateful I have re-found and re-fallen back in love with Beets. 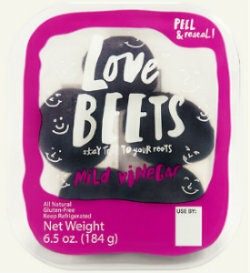 Congrats Love Beets on being this week’s Friday Favorite on BeFreeForMe.com! Both flavors are delicious. 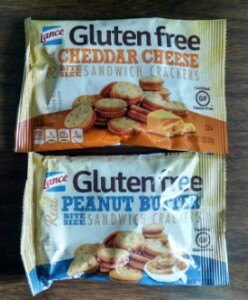 Nestled between two crisply and buttery gluten-free crackers is either real peanut butter or real cheddar cheese. For all these scrumptious reasons, this week’s Friday Favorite is awarded to Lance for their innovation and commitment to making some great gluten-free snacks. Big cheers for Lance for introducing the first ever Gluten-free sandwiches crackers! P.S. Make sure to check out your local grocer for these little gems that are debuting late Spring of 2015. You’re going to love this week’s Friday Favorite on BeFreeForMe.com! Shelton’s Smoke Turkey Snack Sticks are an awesome savory gluten-free snack that is packed with protein and tastes good to beat! These snack sticks are made from turkeys raised without antibiotics and are vegetarian fed. Shelton’s turkey sticks come in 3 flavors, original, pepperoni and jalapeno. The sticks are individually vacuum packed in easy open packages and are shelf stable. 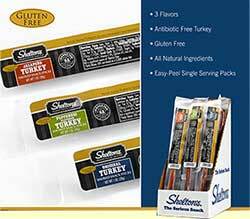 I love that these snack sticks are portable, are only 45 calories per stick, and taste good – the reasons why this week’s Friday Favorite is awarded to Shelton’s Gluten-free Smoked Turkey Snack Sticks! I was thrilled this past week when I found a new gluten-free frozen meal in my conventional grocers frozen case… and it taste good too! Self Healthy Kitchen frozen meals are developed by Self Magazine whose mission is to help people live a healthy, happy life. According to their website, “For years our readers have expressed a need for quick meals that they can feel good about, so we teamed up with Benevida Foods to create SELF Healthy Kitchen, a line of healthy, delicious frozen foods made with simple, natural ingredients. Each minimally processed entrée contains no artificial ingredients and is huge on flavor.” The meal is also all natural, contains no artificial ingredients, and is minimally processed. 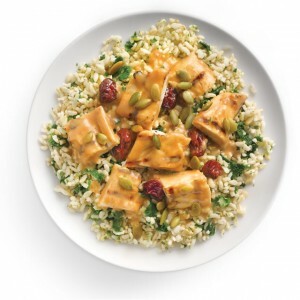 All the varieties of Self Healthy Kitchen are not gluten-free, but the one variety that is gluten-free is the Grilled Drunken Chicken, a dish consisting of grilled chicken topped in a sweet tequila sauce with brown rice blended with kale, cherries and pumpkin seeds. Delicious! Congrats and cheers to Self Healthy Kitchen’s Grilled Drunken Chicken for being chosen as this week’s Friday Favorite on BeFreeForMe.com! PS: Want to find out where to buy? Click on this link to find a retailer near you! Naked Edge Snack’s Veggie-Go’s could quite possible be the absolute best snack-on-the-go. Portable, tasty and full of all things good, Veggie-Go’s make you feel good about snacking. Veggie-Go’s are similar to a fruit strip but are made from whole, organic fruits & veggies. They are also gluten-free, Non-GMO and certified organic. The flavors are unique and tantalizing. Perfect for adults, but loved by kids too. My favorite is the Sweet Potato Pie, a sweet blend of Sweet potatoes, apples and spices, that reminds me of Thanksgiving Day. Other flavors offered are: Mountain Berry Spinach, Cinnamon Spice Beet, Carrot Ginger, and the newest addition, TropiKale, a delicious marriage of tropical fruits of kiwi, guava and mango with nutrient-dense kale, pumpkin, and apple. Cheers and congratulations for Naked Edge Snack’s Veggie-Go’s for being awarded this week’s Friday Favorite on BeFreeForMe.com! 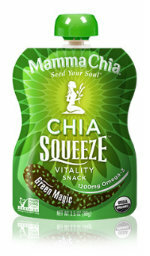 This week’s Friday Favorite is a fun snack that is in a portable pack… Mamma Chia’s Squeeze. This squeezable snack is easy to love. This all natural snack is packed with organic chia seeds, fruits & vegetables resulting in a snack pack that is perfect for everyone – of all ages. Chia Squeezes are also packed with fiber, protein and 1200 milligrams of essential Omega-3s. They are also only 70-80 calories per pouch and not only gluten-free, but vegan too. They come in a variety of flavors including Strawberry Banana, Apple Cinnamon, Mango Coconut, Blackberry Bliss, Wild Raspberry, and my favorite, Green Magic – a magical blend of Chia, Bananas and Mangos, blended with Kale, Spirulina and Chlorella…. Delicious! All these healthy, tasty and convenient reasons are why this week’s Friday Favorite is awarded to Mamma Chia’s Chia Squeeze. Congratulations! When you hear the words “Cookie Dough Ice Cream” you imagine an ice cream that is packed with gluten and dairy. Now… thanks to So Delicious you can enjoy one of our favorite ice cream flavors FREE of these two culprits. The So Delicious Cookie Dough “Ice Cream” is vanilla coconut based and packed with cookie dough chunks and chocolate shavings. I love eating it on a gluten-free ice cream cone, or in a bowl drizzled with chocolate sauce. And if the Cookie-Dough flavor is not your thing, So Delicious also has other gluten and dairy free varieties such as Cherry Amaretto, Chocolate, Chocolate Peanut Butter Swirl, Green Tea and Pomegranate Chip and Coconut. 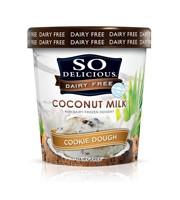 This week’s Friday Favorite is awarded to So Delicious because they let all of us gluten and dairy free folks satisfy our cookie-dough cravings. Thank you SO Delicious! Eating at food trucks at lunchtime has become quite the craze over the past few years. The gourmet foods that are prepared in these roaming food trailers can be unbelievable… gourmet specialties served by some of the hippest chefs in the city. If you want the taste and flavors of these food trucks right in your very own home or office, check out evol foods new Street Tacos. Found in the freezer section of your local grocer (I found mine at Target) the Street Tacos can be whipped up in minutes flat… and rival any fancy-dancy food truck out there. I love the ease of preparing the tacos and the flavorful sauce pouches that come with each package. They are also packed with protein (8-15 grams per serving) and contain healthy all-natural ingredients. They have three (certified) gluten-free varieties: Uncured Bacon, Potato & Poblano Peppers with a pouch of Chipotle Crema; Shredded Chicken & Caramelized Onions with a pouch of Ancho Crema, and my favorite, Sweet Potato, Black Bean & Goat Cheese with a pouch of Salsa Verde. Being able to enjoy fast & tasty food…. Every day and any time (not just when the food truck decides to show up!) 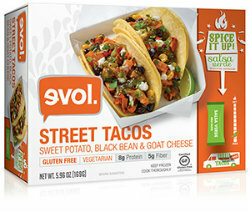 are the reasons why this week’s Friday Favorite on BeFreeForMe.com is awarded to evol foods. Congratulations! Gotta love a bar with a good crunch! And top that crunch off with a burst of fruit and you have yourself a 180 Degree Trail Mix Crunch Bar. I love that these gluten-free, kosher, 100% vegan and all natural bars have a totally different texture than any other bar I have tried. They have a really crunchy, call it actually crispy, snap that is surprisingly tasty and perfect for breakfast or snack time. 180 Degree Snacks achieves this perfect crispy crunch by oven baking the bars… delicious! 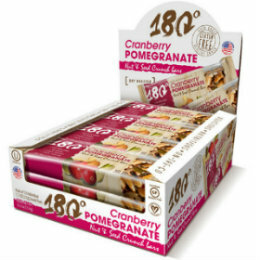 These bars come in two varieties including, Almond Cashew, and my favorite, Cranberry Pomegranate. 180 Degrees also makes other products including Clusters, Nutty Rice Bites and a Trail Mix Crunch. Congratulations to 180 Degree Snacks for making a perfectly crispy and crunchy gluten-free bar and for being awarded this week’s Friday Favorite on BeFreeForMe.com! Cheers!